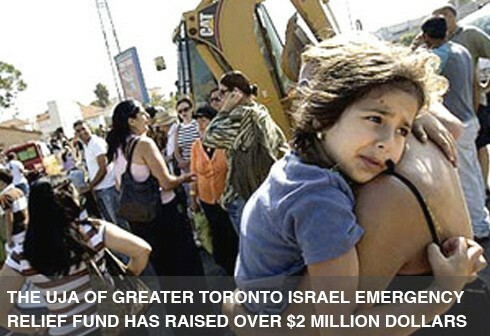 One-hundred percent of funds raised will be allocated to assist southern Israelis living in the danger zone. The selection of projects, how and the extent to which they are funded, is being carried out meticulously and transparently in consultation with Jewish Federation of Canada staff on the ground in Israel. They are working in coordination with our International partners Jewish Federations of North America (JFNA), Keren Hayesod (KH), the Jewish Agency for Israel (JAFI) and the American Joint Distribution Committee (AJDC). As well, in the case of Toronto, oversight is also be carried out by UJA Federation’s Israel & Overseas Volunteer Committee, who are particularly familiar with the area. While there are many appeals going on for specific organizations, the UJA-JFC partnership makes sure that the funds are going directly to where they are needed most in the short, medium and longer term in direct consultation with local and national officials. In this way we can look beyond the scope of just one NGO and leverage our dollars to the right priorities and fill gaps without the risk of redundant funding. 1. Based on UJA’s past experience, we are following a process that will divide the Israel Emergency Relief Funds in three phases: Immediate Relief; Immediate Post-War Recovery; and Long-Term Resilience. 2. In each stage, we are making two types of allocations: 1. National projects that help all Israelis under-fire 2. Allocations to our partners since 2006 in Sderot. 3. The JFC-UIA Israel office is making recommendations to our Israel &Overseas Committee about proposed allocations for each of the three phases. These proposed allocations reflect the input of the JFC-UIA staff in the field and are coordinated with our international partners at KH, JFNA, JAFI and the AJDC. The coordination is avoiding duplication and will ensure that the impact of the funds raised will be optimized. Wherever possible, the JFC-UIA Israel office will try to find leverage opportunities with other funding partners. (a) $150,000 for immediate needs in Sderot. (b) $150K to JAFI and to the AJDC as part of a national collective responsibility formula set by JFC-UIA. The allocation to JAFI will support its Victims of Terror Fund which provides financial assistance and trauma support. The AJDC allocation will support Israelis with special needs and the elderly under fire. (c) $75K to KH for a mobile bomb shelter. (d) $50K to the Israeli Trauma Coalition for trauma support to all areas under fire. 5. In addition to these immediate relief allocations, we have allocated a designated gift of $600K for emergency medical equipment at Soroka Hospital in Beersheva. (b) Providing a kassam-proof protective shield for 2 new daycares in Sderot ($100,000 from UJA matched by $100,000 from the International Fellowship of Christians and Jews). (c) Equipping 5 additional day cares in Sderot and the Eshkol region with equipment to assist during rocket attacks. ($125,000 for 5 daycares). 7. We are recommending that we allocate the resources for the long-term resilience phase within 60 days of a ceasefire. The same process will be used by the team in Israel to develop a menu of projects for the final phase. We expect that this discussion will take place at UJA Federation’s Israel &Overseas Committee September meeting.